Wing commander Andy Green holds the world land speed record and is the only person on earth to have broken the sound barrier on land. In 1997, he took Thrust SSC to over 763mph. Then in 2006 he set a record for a diesel-powered car, taking the JCB Dieselmax to 350mph. Now, alongside former record-holder Richard Noble, he's working on a new project – Bloodhound SSC – which is aiming to break the 1000mph barrier. "Two and a half years ago they came to me with a design that they thought could do 1000mph," he says. "There is no jet fighter, to our knowledge, that can do that speed at low level. "Before I agreed to get involved I said they'd have to convince me that they were serious… and they did. There's a big gulf between saying it can be achieved and actually having the solution." To reach 1000mph, Bloodhound – and Green – will have to sustain 2.5g acceleration (50mph per second) for more than 30 seconds, and then 3g deceleration for around 45 seconds. But he reckons this is the last time that so much time and money will be thrown into an outright speed record. In today's world, is there really any need for a car to do 1000mph? The objectives behind pushing the boundaries have changed, and Green's 2006 diesel record is far more relevant to the world at large. "I didn't think there would be another attempt after Thrust," Green admits. "I think it's possible that this will be the last outright record. Why would you want to go faster, what would it achieve? And secondly, how would you do it? Why would anyone put the effort into that technology. The future is in alternative technologies, economy etc, like the JCB diesel project. 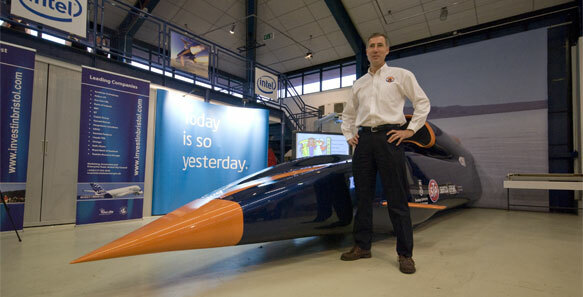 "The principal aim of the Bloodhound project is not to break the record. It's to inspire the next generation of engineers. We've got to show that British engineering is world beating. "There is an estimate that in the next seven years Britain will need 587,000 engineers. We are currently producing 47,000 a year, so we're missing 300,000 people to build this hi-tech, low carbon world that we want for the future. These people need to be inspired. "Technology is driven by achievement. For this project we have to find a way to get the maximum performance from the energy we have on board. It's a much bigger scale, but the challenge is the same, to find an efficient way to use energy for speed. The same logic will be turned around for improving the average mpg in road cars. "But a 12-year-old doesn't set out wanting to improve mpg – that's not inspirational. Wind farms are an incredible technological innovation, but the engineers who designed them weren't inspired by wind farming. They were inspired by Concorde and such." The attempt on breaking a 1000mph is likely to be made in 2011, and the team is planning to use modern technology to take it to as many people as possible. "The best guess is for a Spring 2011 target. We think that's achievable to get the car out. But companies are providing the funding and we are living in a recession, so it is dependent on the economy. "We need to inspire people, and for that they need to see it. There's no use doing this if people don't know about it, or can't get access to it. We'll have a live feed on the internet – we will give it away to the whole world for free. Anyone can watch it. "If a 1000mph car doesn't get the future automotive engineers inspired, frankly they must be dead." Andy Green and the Bloodhound project will be at the 2010 AUTOSPORT International Show at the Birmingham NEC from January 14-17. They will introduce the attempt to members of the public – along with a full-size replica of the front two thirds of the Bloodhound SSC car.